The last two spots in the Final Four are up for grabs tonight. Mat wrestling at its finest. Noam Dar is finally doing the stuff I knew he was capable of before he turned in two stinkers earlier in the tournament. He taunts Sabre to get him to charge, then dropkicks him in the knee. But Sabre is great too, working the arm with holds and a crazy stomp. These two guys know each other so well. It's fun to watch them try to kill each other. Sabre keeps attacking the arm. A sunset flip from Dar leads to like fifteen pinning predicaments reversals. Dar hits his super cocky uppercut, pauses to celebrate and gets Half Nelson Suplexed for a two count. Sabre goes for his Penalty Kick, but Dar dodges and kicks Sabre's legs out from under him. A fisherman suplex from Dar. A PK from Sabre. Sabre gets into his guillotine choke position but Dar fights out of it, puts Sabre on the apron. Sabre runs at him with a clothesline, Dar ducks and kicks the knee again. Then hits a Suicide Dive. Back in the ring, Dar nails a big dropkick to the back of Sabre's head in the corner. Sabre goes for the Octopus, it's blocked. He puts Dar in a jumping triangle, which is countered into a knee bar, which is countered into an arm bar, which is modified into a pin. Dar catches Sabre out of the air directly into a backslide attempt. Sabre armbar countered into a pinfall attempt, into a cross armbar into a pinfall in to a cross armbar. Dar grabs the rope. Sabre goes up top, tries for a double knee onto Dar but Dar moves. Dar hits a knee from the top rope onto Sabre's bad leg. Knee bar and Sabre reaches for the ropes but they both roll out of the ring and to the floor. Sabre lands bad on his elbow. He's back into the ring at 9. Dar attacks the arm for awhile, to great effect. But Sabre flys into a crazy Rings of Saturn maneuver executed entirely with his legs. Dar has no choice but to tap out. 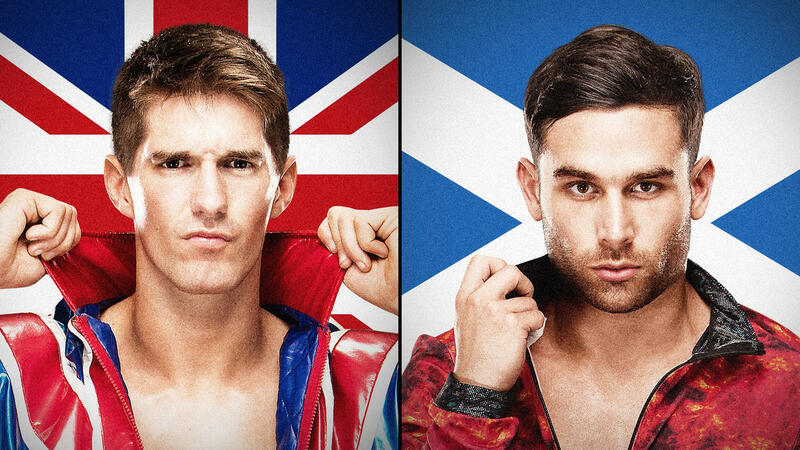 WINNER: Zack Sabre Jr via Submission. Chain Wrestling and a Stalemate. I can't wait for this to heat up. Perkins does his spinning headscissors thing, and "dubsteps". Swann gets Perkins in a head scissor lock, but Perkins does a head stand to get out of it. He dabs again. Swann does not like being shown up. So he does a bunch of super quick stuff and shows up Perkins, dabbing in his face too. Back and forth with fun, athletic moves until Perkins is on the outside. Swann tries for a moonsault from the apron, but lands bad and tweaks his knee. Perkins hits his springboard rope swing dropkick to Swann and puts him back in the ring. Slingshot Senton Atomico from Perkins. Snap Suplex directly into a back suplex from Perkins. Two Count. Rest hold and Swann gets out of it, hits a spinning hook kick. Perkins targets the bad knee in a myriad of ways, finally putting Swann in a toe hold and then an Indian Deathlock. Swann slaps Perkins, Perkins puts him in a butterfly lock. Swann hits him with a bunch of different kicks and a jumping DDT. Two Count. Neckbreaker and a Tiger Suplex setup into a Gut Buster. Wow. Two Count. Rich Swann is not moving well on that leg. Swann gets put on the top rope, Hurricanrana'd off, lands with whiplash on the bad leg. Still, he puts Perkins down, then does his rolling thunder frog splash and a cartwheel moonsault. Swann seems to be getting him in position for the Phoenix Splash, but Perkins locks on the knee bar. Swann gets to the ropes. Perkins gets in some kicks, but Swann hits a Tiger Driver into a Jacknife pinning predicament for a nearfall. Perkins hits his modified GTS, then slaps on the kneebar. WINNER: TJ Perkins by Submission. Immediately after Swann taps, Perkins takes off the hold, and seems to be apologizing to Swann. They're such great friends. I love this story.